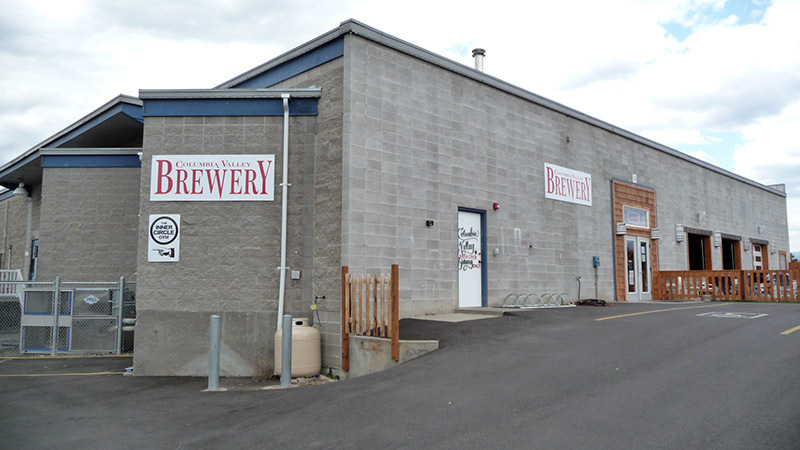 Columbia Valley Brewing is in a generic grey cinder block building that is shared with a gym and adorned only with a small amount of blue trim just below the roof. However, itâ€™s right across the street from a small park on the Columbia River thatâ€™s part of the extensive paved loop trail in town. The large outdoor beer garden has some peek-a-boo views of the river between the trees in the park, and is a comfortable space furnished with white chairs with light blue nylon webbing and matching round glass-topped tables, mostly on grass. Thereâ€™s also a small stage at one side. Three roll-up glass garage doors open between the outside and inside. Inside is also a large space with assorted wood (and simulated wood) tables and chairs. The ceiling is double-height, the floors are concrete, and there is a long corrugated metal, L-shaped, wood-topped bar with tall light wood padded chairs on one side. 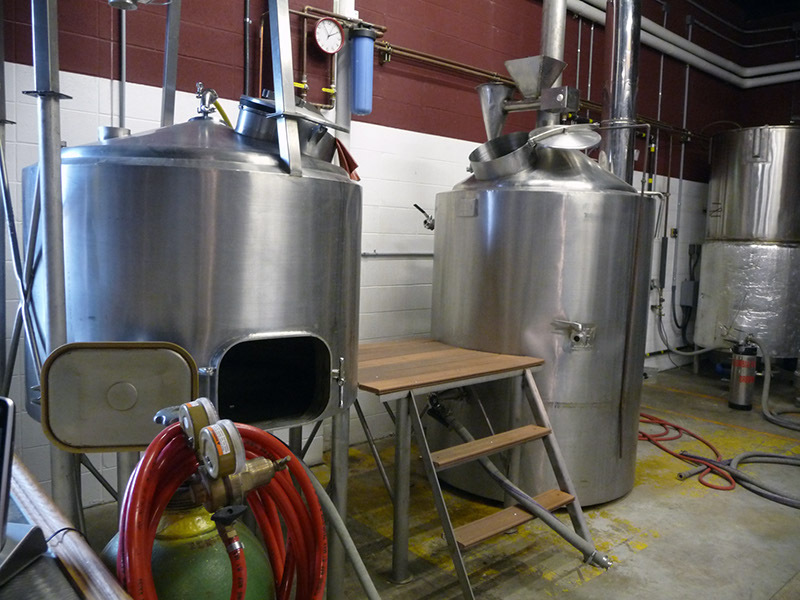 The brewery is to the left behind a matching corrugated metal wood-topped counter lined with more of the same chairs. Pool tables are at the opposite end of the room along with another small stage set below a large projection TV screen. At one side are two groupings of comfortable looking couches and side chairs as well as a foosball table. Itâ€™s a locals place (though visitors are OK). 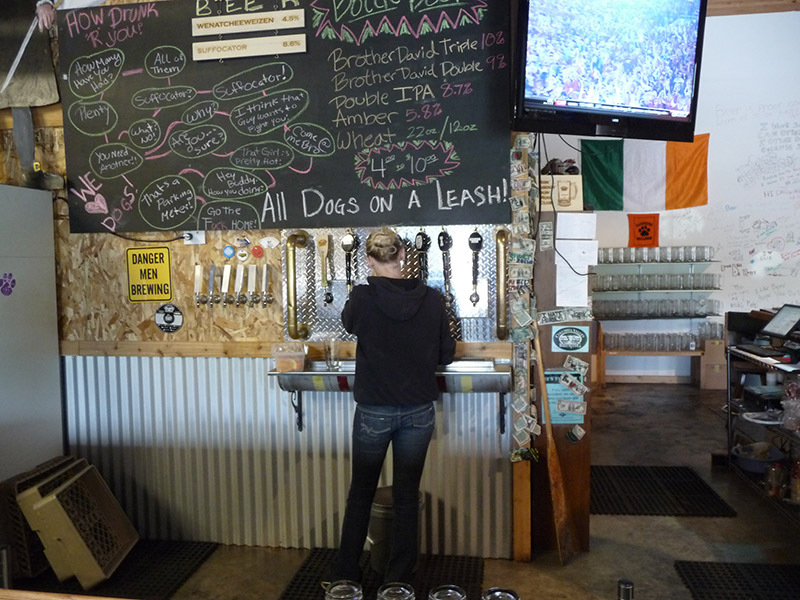 The bartender on our visit could not accurately describe the only two house-made beers available (Wenatchee Weizen and â€œSuffocatorâ€, the latter described as a stout, but actually more accurately called an Imperial amber on their Facebook page). Neither beer was truly outstanding. Their brewing techniques still need some work. Itâ€™s a shame, as the space is really quite nice, so we hope their beer improves to do it justice. There is a parking lot. The only food is pretzels.